Cashmerette’s Appleton wrap dress is golden! Cashmerette Appleton wrap dress. 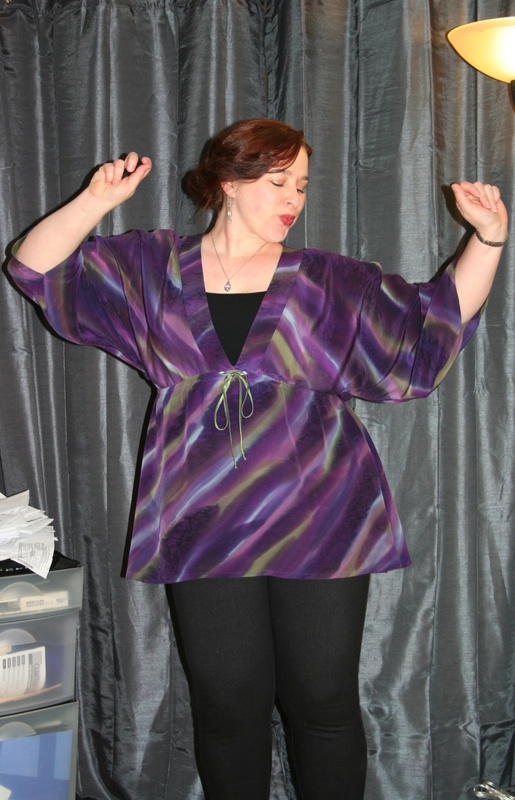 This plus-size pattern rocks! I just completed (and wore out in public) my first Appleton wrap dress made from Cashmerette’s inaugural plus-size, multiple cup-size pattern. Folks, this pattern is excellent, and if you’re at all curvalicious and a size 12 or up, you should give the Appleton a try. I mean, most figures look awesome in a wrap dress–that is the magic of the wrap dress. I made mine out of a polyester/spandex ITY knit with 50% crossgrain stretch that I purchased from Michael Levine Fabrics. I don’t usually buy ITY, but I just fell in love with the marbled print and the colors of this fabric. As this was my first knit dress project, my first use of ITY, the first time I intended to use my serger, AND my first time using this specific pattern, I did a lot of stitch testing on scraps of the fabric first and I spent a lot of time thinking about the pattern sizing and whether adjustments would be needed to fit me. After measuring the pattern lengths and widths at key points, and considering the amount of negative ease designed into it, I decided that a size 14 cup size E/F on the top would be best, and that a size 16 was necessary for the bottom half. So from the waist down, I graded the pattern out to a 16 from a 14. This turned out to work very well, although when I first tried the dress on I was a little concerned about the depth of the front wrap and whether or not too much cleavage was showing for polite society (ahem). Eventually though, after wearing it for photographs I decided: Dang, I look good in this thing. It’s pretty much perfect, although it is Cleavage City going on up top. That’s ok, if I need to be more covered a lace camisole that snaps onto one’s bra is the perfect solution. Side note: Do you ever experience PPD: post-project disillusionment? Sometimes I do. Usually when the image in my head of how I’ll look in something doesn’t match the reality. At first anyway. It’s kind of a combination of a feeling of anti-climax and coming face to face with harsh reality (wait, you mean I’m not 5′ 10″ and shaped like Cindy Crawford? when did that happen??). That’s kind of the feeling I had when I first put the Appleton on after construction was done and hems still needed to be sewn. It’s not the fault of the dress or pattern; it’s all in my head. But now I’m happy about how the dress looks on me. Anyway, I’m kind of in love with the Cashmerette Appleton now. It’s been a long time since I’ve had a great wrap dress in my closet, and now I have one. Soon I’ll have more! I’ve got three more cuts of ITY waiting in the wings to become Appletons. I think I’ve found another TNT pattern (the first is the Kirsten Kimono Tee from Maria Denmark, and the second is True Bias’s Sutton Blouse). Sewing the Appleton was pretty easy, although I hit a few bumps in the road due to imprecise easing of the neck bands into the bodice AND my machine’s utter hatred of clear elastic. I ended up sewing most of the dress on my Janome MC3000 using its knit/lightning stitch; it’s the only one that didn’t make the ITY tunnel up, even with a low tension setting. But I serged the side seams and serge-finished the sleeve armholes; also serge-finished the hems before sewing them in place with a twin needle straight stitch to mimic a coverstitch. I also used the twin needle to topstitch the neck band seam allowances. It took me 8 hours, all told, including testing stitches, to sew the Appleton, and I got most of it done in one day. That does not include the fabric cutting. I think the future versions will go a lot quicker, but maybe only by 1 or 2 hours. It’s the pinning that takes so much time, with ITY, because it’s so shifty. I made the waist ties extra long to wrap around me. This classic wrap dress is designed to play up your curves with a crossover front, a built-in waist tie, and a deep V-neck. Designed by and for curvy women, the Appleton’s innovative neckband construction prevents gaping across your bust. Some confusion over the step for attaching the waist ties to the neck bands, but the sewalong video really cleared that up. The printed instructions and the diagram are not at all clear for that step. But other than that, it was a breeze! I love the design and the fact that it’s created for plus sizes with different cup size pattern pieces. I LOVE that for the first time ever I only had to make one change for sizing: my bottom is slightly larger than my top so I graded out one size from the waist down. All the other adjustments I would have to make are already built into the pattern: short torso, sway back, full bust. SCORE! And I LOVE how it looks! I’m not sure that the waist tie hole method is the best possible approach; I might prefer something a little more cleanly finished, like a sewn buttonhole or bound buttonhole. Maybe I’ll test that out on a future version. It’s certainly quick and relatively painless, but I did have trouble working around it when serging the side seams. Probably the answer is to overlock the side seam allowances and then stitch them as normal on a sewing machine. I chose my size based on my measurements and the pattern size chart. I graded from a size 14 in the shoulders/bust/upper waist to a 16 from the waist down. Used the E/F cup size pattern (my full bust measures 43″, upper bust 39.5″, waist 36″, hip 45″). I also changed the sleeve length to a true 3/4. The 3/4 version that’s included in the pattern is more like elbow length, IMO–and I don’t have long arms. A true 3/4 sleeve falls about midway down the forearm, so I just created a new hemline between the elbow and the full length. I like this length, although I might make the elbow length in the future. I also made the longest/largest size waist tie so I can wrap them around me at least one full time and then have a nice long bow. I used a combination of regular sewing machine construction (knit/lightning stitch), serging, and twin-needle stitching for the sleeve and skirt hems and for topstitching the neckband’s seam allowances in place. It worked very well. Although I discovered that my sewing machine and serger HATE clear elastic. So in future versions I’ll just use petersham or twill tape as the shoulder seam stabilizer. Most of the other sewers who have made this dress have commented on how high the waist tie sits–well, on me, because I have a very short torso, the tie hits just a smidge above the smallest part of my waist, so it’s perfect. I’m thrilled! Absolutely! I’ve got 3 more cuts of ITY waiting, and perhaps even a stretch velvet for winter. I love wrap dresses and it’s been a while since I’ve had a good one to wear. Can’t wait to have so many in my closet! Overall I really like this pattern. 5 stars! It’s well drafted, the instructions are mostly clear, it sews easily and pretty quickly (it took me about 8 hours, but I made a few mistakes and had to redo some small areas, plus it was my first time using my serger), and the result is fantastic. There’s definitely some cleavage happening, but that’s never concerned me much. A snap at the crossover will prevent any potential wardrobe malfunctions. I feel I should point out that to eliminate my bra-band back pudge in these pics I am wearing a smoothing tank underneath the dress.